Our 26 day Caribbean cruise would soon come to an end. 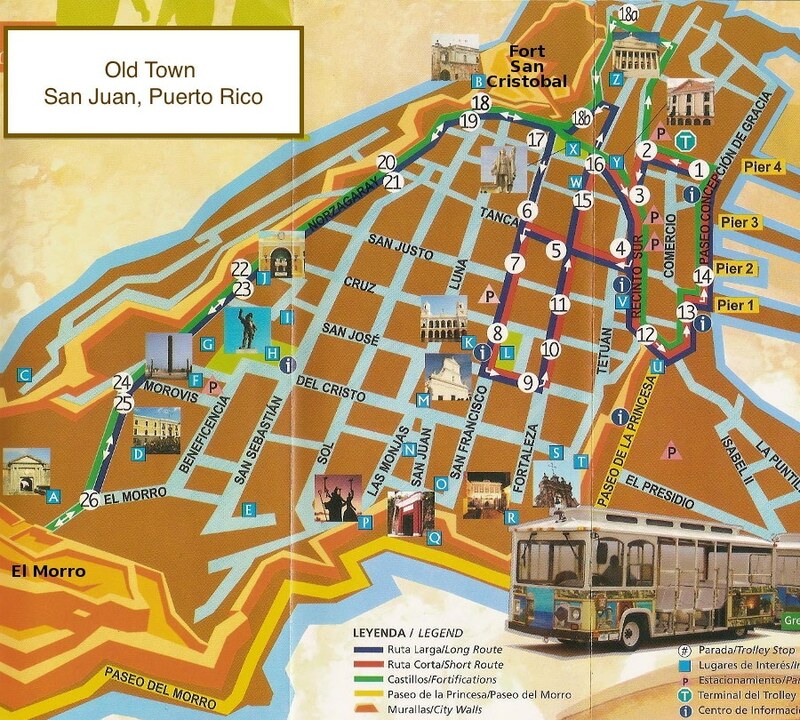 For this next stop after St. Barts, the ship docked right in old town San Juan, Puerto Rico. David had visited San Juan many years ago when in the navy, so he had a general sense of the town. We booked no tours, figuring it would be pretty easy to get around on our own. The “free” trolley was easy to find very close to where we exited the port. 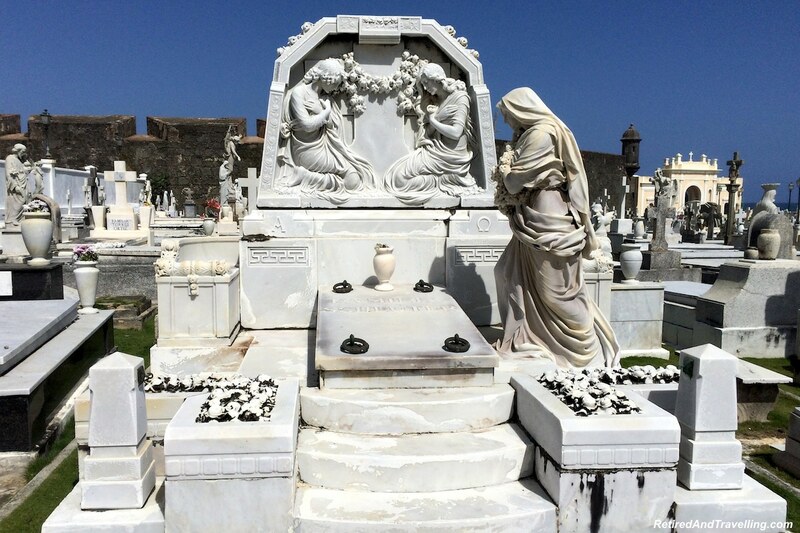 We were off to explore the town, the old fort and San Juan cemetery statues! Hopping on the free open air trolley, we took an outside seat to let David snap some photos as we went around old town. 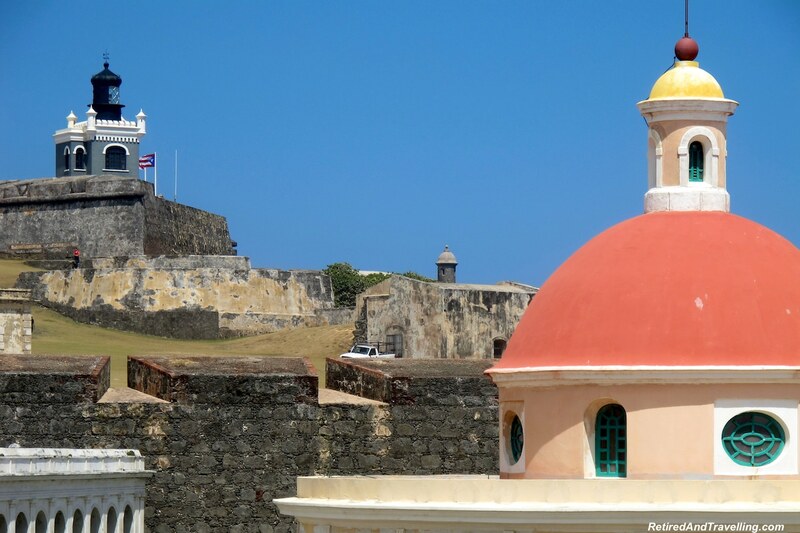 We planned to spend most of our visit at the San Juan National Historic Site comprised of Castillo San Cristobal and Castillo San Felipe del Morro. As we were approaching that trolley stop, with the fort visible ahead, we got off the trolley one stop early (24) when we saw a large cemetery spread out below the fort. We would visit there first. 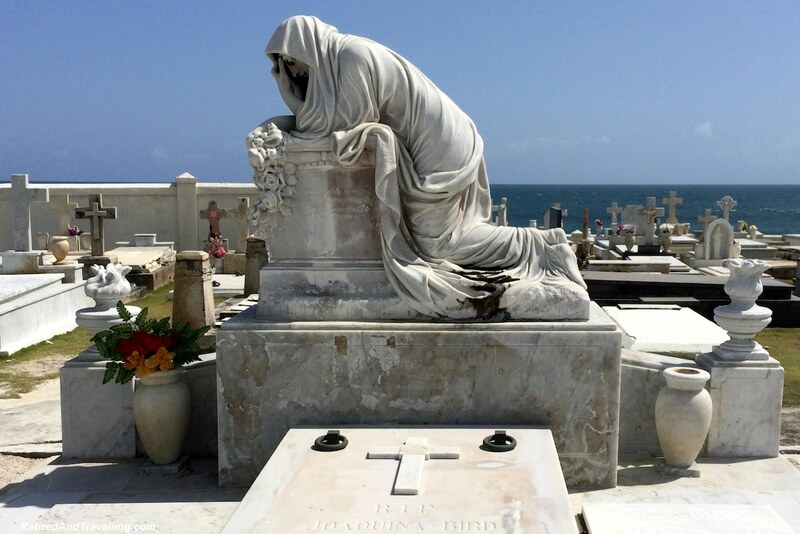 Approaching the cemetery from higher ground we could see the full Cementerio Santa Maria Magdalena de Pazzis and the vast array of San Juan cemetery statues laid out in front of us, sparkling white with the blue ocean behind it and the blue sun above. We took the ramp down and went through the tunnel to get into the cemetery entrance. While it looks like you can walk down from the fort, this was the only way to get in and out of the cemetery (unless you were planning a water assault). 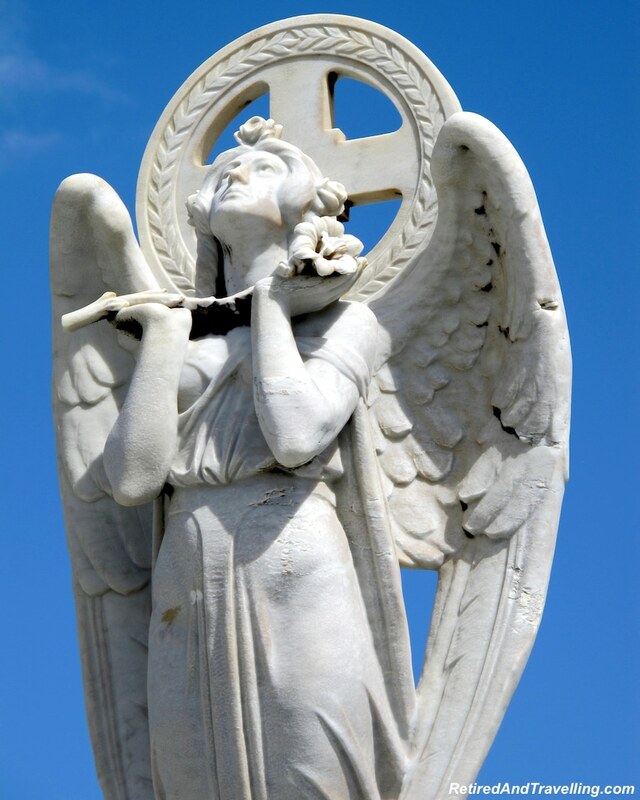 It was evident from the moment you entered the cemetery that we were in for a major surprise. 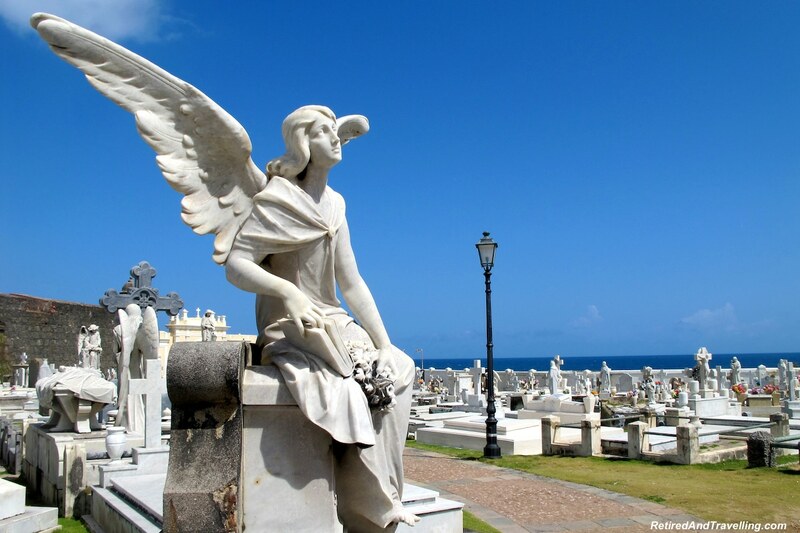 The San Juan cemetery statues adorning the graves were intricate and expansive – forming a statue gallery honouring the dead. In addition to the beautiful statues, we found lots of flowers left at the graves and several flags whipping in the wind. We spent a while wandering and admiring this wonderful site. 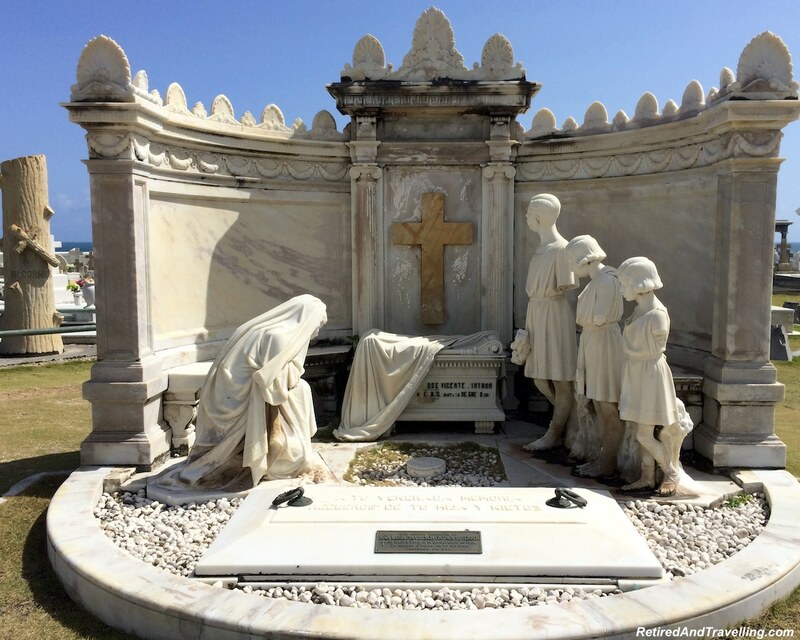 Leaving the cemetery and the San Juan cemetery statues, we climbed the hill to wander outside Castillo San Cristobal and Castillo San Felipe del Morro. By now I was dragging in the bright sunshine and heat so we opted not to pay to go inside the fort. As we headed back to the trolley stop we could see the full fort vista in front of us. 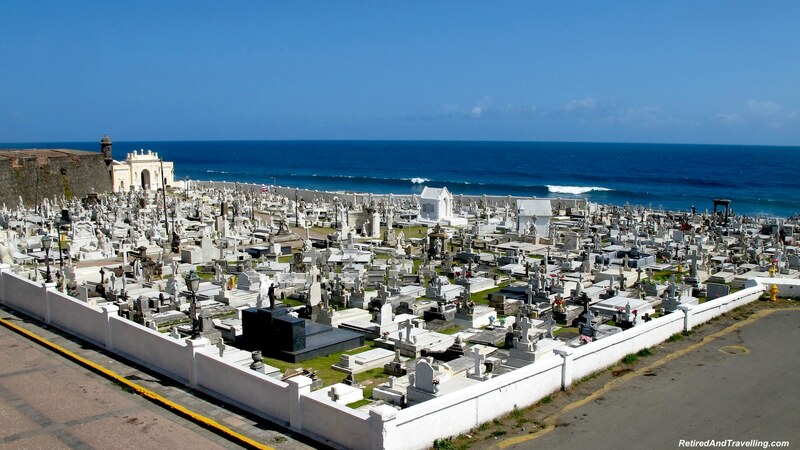 We would catch a great view of the fort and the cemetery as we sailed out of San Juan at the end of the day. We caught the trolley back to the port area. It was time to start at the top of David’s list of coffee shops. 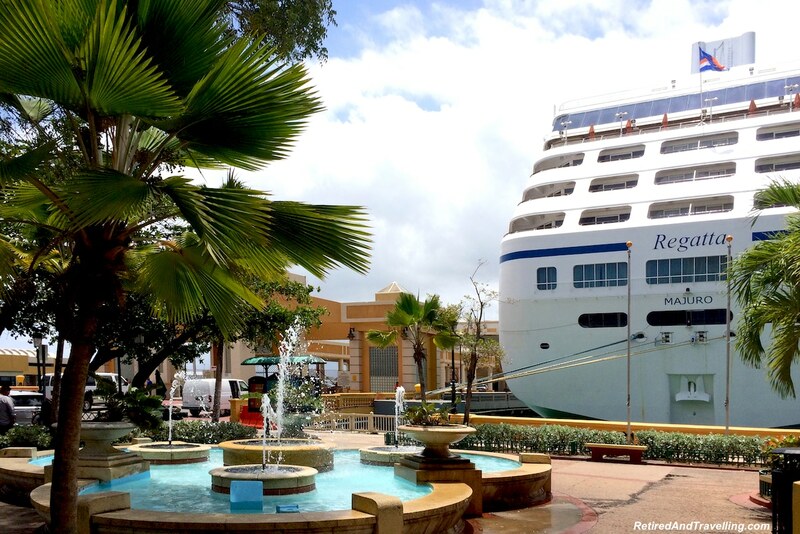 We had stopped at many coffee ports on our 26 day cruise (Guatemala, Costa Rica, Cartagena). 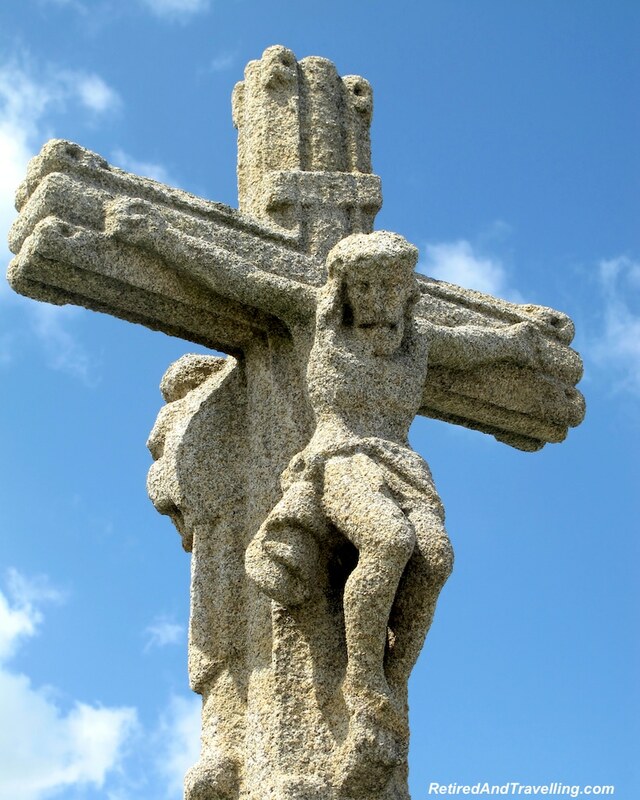 But David had yet to find a coffee he wanted to take home. 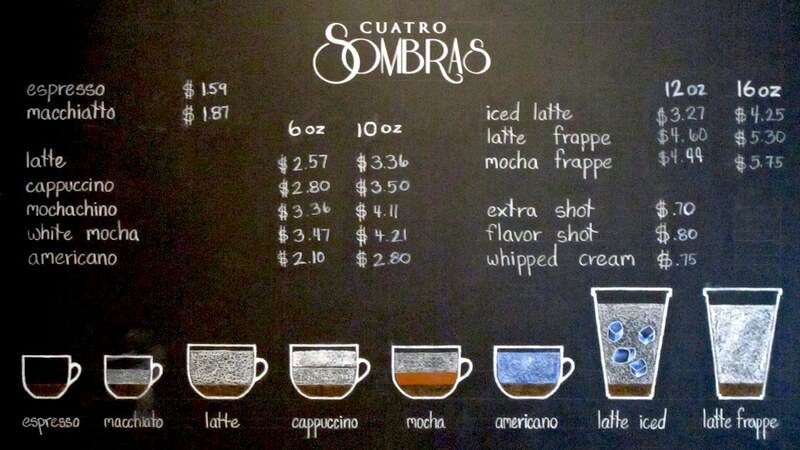 We lucked out at our first stop at Cuatro Sombras. The mocha coffee frappe I had cooled me down. It was a great blend of dark chocolate and rich coffee. David tried an espresso to taste the pure flavour of the coffee. He then bought a bag of coffee beans to take home. Sated, our coffee shopping venture ended quicker than planned. We sat by the fountain outside the port gates before heading back on board. It offered a great view of our ship Regatta moored so close to the old port. 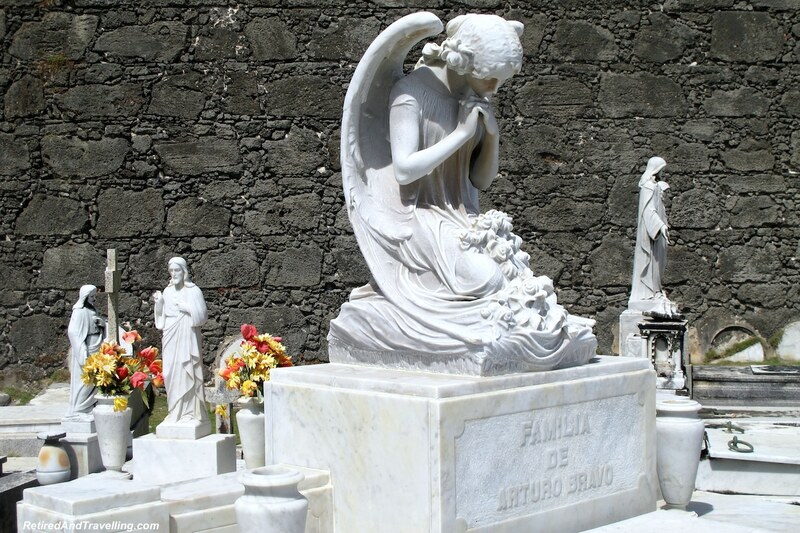 I must admit to being surprised by San Juan and was totally unprepared for the San Juan cemetery statues. Some day we may plan to come back and explore the beaches and outside of the old town. 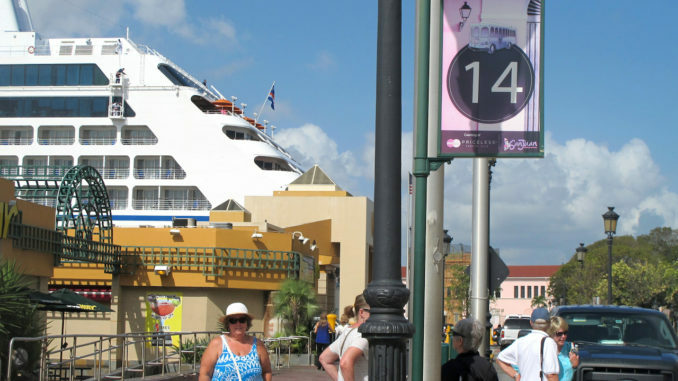 We were a regular visitor to Nassau, Bahamas. This Nassau visit meant we were getting close to the end of our trip around the eastern Caribbean islands. 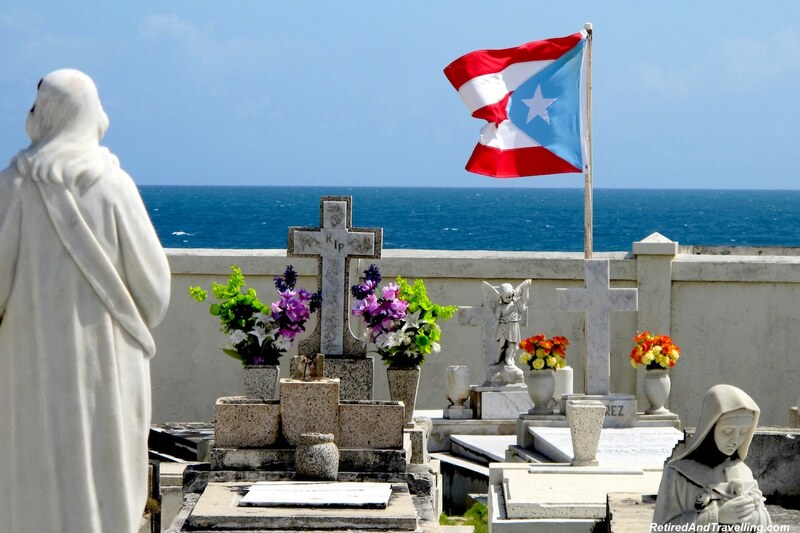 What should we see if we return to San Juan and Puerto Rico? Were you surprised by the cemetery?